We’d love your help. Let us know what’s wrong with this preview of Cochabamba Conspiracy by Brinn Colenda. To ask other readers questions about Cochabamba Conspiracy, please sign up. The Cochabamba Conspiracy is a fast-paced, plot-driven, action-oriented, unusual (that said in a good way) novel set in the late 1990s involving settings, characters, and situations that invite the reader to turn the next page. The physical locations in The Cochabamba Conspiracy include a few that will be familiar to many readers of political thrillers: Washington DC and the surrounding countryside in Maryland and Virginia. Then there are a few locations that are used by American authors sometime The Cochabamba Conspiracy is a fast-paced, plot-driven, action-oriented, unusual (that said in a good way) novel set in the late 1990s involving settings, characters, and situations that invite the reader to turn the next page. The physical locations in The Cochabamba Conspiracy include a few that will be familiar to many readers of political thrillers: Washington DC and the surrounding countryside in Maryland and Virginia. Then there are a few locations that are used by American authors sometimes - but not often: Arizona, Texas, Mississippi, India, Germany, Bulgaria, Libya, Cuba, Panama, and the inside of airplanes and government biological research institutes. One of the great treats of The Cochabamba Conspiracy is featuring in great detail locations that will be very unfamiliar to the vast bulk of the American reading audience. These are the cities and the countryside of Bolivia, a landlocked country high in the Andes Mountains of South America. Few Americans know much about Bolivia: perhaps they remember that Butch Cassidy and the Sundance Kid may, or may not, have met their demise in a shoot-out as depicted in a wonderfully entertaining movie featuring their names. Fewer norteamericanos have ever been to Bolivia and understand why drinking mate de coca is required to function at high altitude. The cast of characters in The Cochabamba Conspiracy is also a mixture of the familiar and the unfamiliar. We meet very senior political officials, ambassadors and their immediate staffs, high-level officers of the military, terrorist masters, and scientists with key skills and information. All of these are standard fare in a modern techno-thriller. But we also are introduced to mid-grade and lower-level individuals, who are important characters in the story and without whose implementing actions the senior folks would be left orchestrating an empty pit. The storyline is carried forward by a complex team of characters who are required to operate any multifaceted organization. The main character of the story reminds this reviewer of the comic strip, radio, and 1936 movie serial character Ace Drummond written by World War I Ace Eddie Rickenbacker or the subsequent comic strip, novel, and late 1950s TV series character Steve Canyon. Like James Bond, the main character of The Cochabamba Conspiracy is not the protagonist - the main character is constantly responding to situations and actions of a series of extremely capable and despicable bad guys, who drive the plot forward. The main character is handsome, likeable, drives a flashy British sports car, is capable, but has the unfortunate propensity to anger a series of folks who may or may not need reining in. By himself, the main character is incapable of solving all the challenges that will come his way and fortunately will have a number of sidekicks and guardians that help bring about a resolution to the overall and main character's story. The organizations highlighted in The Cochabamba Conspiracy will introduce the reader to situations and circumstances for which they are likely uninitiated. The multipart country-team organization fielded by the US Government to represent us in foreign nations is wonderfully exposed as a dysfunctional composite of competing interests - in this case failing to function without external intervention. Careerism and sexual temptation are probably the most simple and understandable of factors that are at play in a country where Che Guevara was executed in the field by Bolivian military forces trained by the United States. Modern narcotraffickers have as much power as and appear to be linked to forces within legitimate governments. The Cochabamba Conspiracy has many parallel plots to intrigue and challenge our accepted view of many of our cherished institutions. The prologue opens with the deliberate death by infectious disease of Indian nationals at the hands of a Russian scientist. The lure of the rewards of the drug trade form an essential backbone to the overall plot - from the high and mighty to the campesino in the Altiplano. Old-fashioned espionage with some familiar organizations has its role as does the massive environmental devastation resulting from the production of illegal drugs. The latter is of interest because Americans go out of their way to save a few fish found only in artificial settings, are shocked by the mayhem across our southern border, but turn a blind eye to the ecological havoc resulting from illegal drugs produced for consumption in the United States. Similar to the blind eyes that we turn to the production of goods manufactured overseas that keep prices low in our favorite big box stores? Probably the most well-developed scenes are those that involve the bureaucratic infighting and careerism of employees of the US federal government. It is no secret that the State Department is jealous of the money and power of the Department of Defense - but the issue is brought down to the working level when getting credit is an impediment to protecting American servicemen who are in immediate danger. If the corruption in the drug interdiction program is anything like what is portrayed in The Cochabamba Conspiracy, then we need only look to body counts during the Vietnam War as the precedent. Colenda's written a superb conspiracy story based in Cochabamba, Bolivia. If you're a Tom Clancy fan, you won't be disappointed with this book! The characters and plots are believable and draw you in from page one. Colenda has a real flair for description. I have to say that his flight scenes are so accurate you will feel the rolls, dips and storms encountered in the story. Not only are the flight scenes realistic, but Colenda also shares the breathtaking beauty of Bolivia. 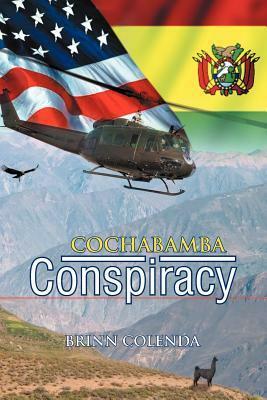 The Cochabamba Conspira Colenda's written a superb conspiracy story based in Cochabamba, Bolivia. If you're a Tom Clancy fan, you won't be disappointed with this book! Very good action packed adventure in a part of the world most people don't think much about. Nicely drawn characters with enough plot twists and turns to keep the reader wanting more. The authors knowledge of and insight into the military operations especially flying are realistic and compelling. Once you start it, you won't put it down. This thriller was an absolute page-turner. I couldn't put it down. Brinn Colenda's characters were so real that I'm sure they ARE real. His plot was intriguing and his characters well developed. This is an excellent read. Cochabamba Conspiracy was a fun read !! It was action packed from start to finish with great characters, exciting twists and turns in the plot ... and enough romance and sexual intrigue to keep a girl interested. Colenda leaves it open ... looking forward to the sequel. What a great read! Excellent book for the first in the series. I enjoyed the location and background. Colenda seems to have a strong connection to his characters. Looking forward to the next one. I have always been in love with books. When I was a kid, I read everything I could get my hands on--mysteries, histories, biographies, thrillers, Reader's Digest, Boy's Life, it didn't matter. During the summers, I would stay up all night reading. Completely intellectually undisciplined and stuffed full of useless trivia, I read my way into the Air Force Academy by acing multiple-choice standardiz I have always been in love with books. When I was a kid, I read everything I could get my hands on--mysteries, histories, biographies, thrillers, Reader's Digest, Boy's Life, it didn't matter. During the summers, I would stay up all night reading. Completely intellectually undisciplined and stuffed full of useless trivia, I read my way into the Air Force Academy by acing multiple-choice standardized tests. I quickly learned that I was not nearly as smart as I thought I was...something that has been repeatedly re-emphasized as I continue to meet amazing people on my life's path-- there are lots of intelligent, talented, and wonderful people on this planet. I had the good fortune to spend two years working in the U.S. Embassy in La Paz, Bolivia, as the Chief of the Air Force Section of the U.S. Military Group-Bolivia. I checked out in the embassy Beechcraft C-12 Super King aircraft and flew all over that gorgeous country, going places that most Bolivians had never visited. Tour completed, I won a Post Graduate Fellowship at the Hoover Institution of War, Revolution and Peace at Stanford University. Again, I was surrounded by people with enormous intellects-- Nobel Prize winners, former cabinet secretaries, ambassadors, tenured professors, and the like. All seemed fascinated by my stories about Bolivia. Eventually, I got the message-- if these well traveled and educated people did not have a clue about Bolivia, then non-Nobel Prize winners, non-former cabinet secretaries, non-ambassadors, non-tenured professors, etc probably wouldn't either. So, I started writing the stories down. As I am a great fan of thrillers, I decided to write a thriller located in Bolivia, based on my experiences, suitably enhanced of course (I am a pilot, after all!). Then life intervened and my wife and I welcomed three baby boys into our lives within the space of twenty months. Yikes! So, I put the writing on hold for more than a decade. Eventually, I started working with the manuscript at night. With the help of some really good (and extra patient) writing coaches, I finally beat it into shape, even won an award. The result is a political-military thriller, The Cochabamba Conspiracy. Book two of the series, Homeland Burning, is out now as is Book Three, Chita Quest.